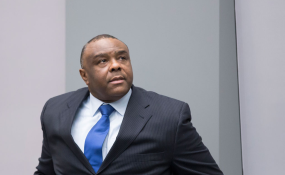 Congolese opposition leader Jean-Pierre Bemba has moved to appeal the penalty handed to him last month at the International Criminal Court (ICC) for witness tampering, deeming it unfair and disproportionate. The 55-year-old former rebel commander received a prison sentence of 12 months, which he did not serve since he had spent a longer period in detention during the trial, and a fine of €300,000 (US$ 346,000). In an October 18 notice of appeal, Bemba's lawyer Melinda Taylor cited three grounds of appeal, and said the defense would request the appeals chamber to reverse the sentence and terminate the case against Bemba. On September 17, 2018, Trial Chamber VII judges issued new sentences for Bemba and his former lawyers, Aimé Kilolo Musamba and Jean-Jacques Mangenda Kabongo. The three were convicted in October 2016 for soliciting false testimonies and corruptly influencing 14 witnesses who testified for Bemba in his main trial for war crimes and crimes against humanity. Bemba was acquitted in that trial last June. The sentences announced last month were the same as those which Trial Chamber VII had issued in March last year, before the appeals chamber ordered a re-sentencing after finding that the sentencing decision contained errors. While delivering the re-sentencing decision, Trial Chamber VII Presiding Judge Bertram Schmitt stated that the chamber had not deemed it appropriate to depart from the earlier sentences. He said the judges considered that their prior sentencing considerations remained mostly accurate even after the appeals ruling that reversed the sentences. This was because the appeals chamber "found errors only on limited points" in the earlier sentencing decision. However, in the first ground of appeal, defense lawyer Taylor faults the trial chamber for failing to comply with the appeals chamber's directive to issue a concrete determination of the degree of Bemba's participation and the harm caused by his conduct. She said this error resulted in a disproportionate sentence for Bemba. Accordingly, the defense will ask the appeals chamber to exercise its power under Article 81(2)(b) to set aside Bemba's convictions, which it claims rest on a flawed evidentiary record. This article provides that, if on an appeal against a sentence the court considers that there are grounds on which the conviction might be set aside wholly or in part, the appeals chamber may render a decision on the conviction. Taylor contends that, at resentencing, the trial chamber repeated errors it made in the initial sentencing decision. The alleged errors included failure to issue a "fact-specific determination of the harm caused by the false testimony," and the "arbitrary decision" by the judges to increase their determination of the gravity they attached to the offences of giving false testimony. Further, Taylor says judges erred by assessing the amount of Bemba's fine on the basis of his means rather than his culpability. Whereas Bemba was handed a €300,000 fine, his former lawyer Kilolo, who was convicted on similar offences, received a €30,000 fine. Judges explained that because Bemba had "considerably more means" than Kilolo, his "substantially higher fine was expected to have "equivalent deterrent effect." Under the second ground of appeal, the defense says judges abused their discretion and erred in law by failing to stay the proceedings, discharge Bemba, or provide a remedy to "the cumulative impact of egregious violations" of his rights. Taylor cites Bemba's "unreasonable and arbitrary length of detention" and the "highly prejudicial and inflammatory statements" by the prosecution, including those that she said attempted to controvert Bemba's main case acquittal. According to her, these violations undermined the fairness of the proceedings and resulted in a disproportionate sentence. She adds that the appropriate remedy would be to grant Bemba unconditional release, after termination of proceedings against him and revocation of the conviction. Taylor says Bemba's June 12, 2018 release failed to remedy the full extent of the harm caused by the fact that his detention was at least four-and-a-half times greater than the amount judged appropriate for his culpability, and it came more than three-and-a-half years after the Single Judge first determined that the length had ceased to be reasonable and proportionate. In the third ground for appeal, the defense claims the trial imposed a disproportionate sentence, which exceeds the level of his culpability when viewed in light of the total punishment he endured.